Oh yes. I am officially back home to Sweden. 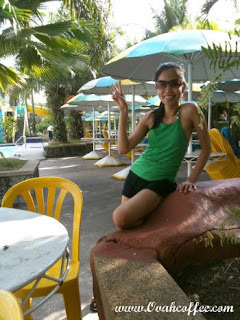 I returned from my February 1-28 Philippine vacation on the evening of the first day of March. Leaving my family behind for the third time still made me cry. Weeks before flying back to Sweden, I made myself believe that I would no longer feel the pain of goodbyes. Unfortunately, I was wrong. For reasons I could not find, the pain was deeper and the tears were heavier this time around. But well, goodbyes had to be done. Anyway, from the warm weather of the Philippines (the temperature was at +33°C when I left Manila), Stockholm surprised me with a very cold -5°C. -5°C wasn't supposed to be that cold but due to snowstorm, it felt like Stockholm was experiencing 20 more degrees lower. Brrrr. Because of the storm that hit most parts of north Sweden, many trains and buses weren't given the green light during that night. Madde (my boyfriend's younger and only sister who spent a week and a half with me in Manila) and I could not find a way to be in our hometown the same day. The good thing was Mikael, my boyfriend's older brother was able to fetch us at the airport. We spent the night at his home in Uppsala (a city which lies next to Stockholm), took the earliest train at 7:07 the following morning and reached Söderhamn, our hometown a couple of hours later. Mom Lena and my boyfriend were waiting for us at the train station which had been a huge sort of relief for me. The vacation's finally over. I am now back to the loving arms of my boyfriend and back to school assignments and blogging! Have a fun day everyone! I know that is a drastic change to go from weather in the Philippines to weather in Sweden. It might as well be like Jamaica compared to Tibet! Anyway, glad you made it back safely to Sweden! Hugs for you my dear blugging friend! Have a nice day my blugging friend! Hugs!